The first Notting Hill Carnival took place in 1964 when London's Caribbean community introduced the carnival to ease racial tensions. 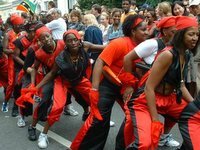 Since then it has become a popular and colourful annual event celebrated by more than two million Londoners of all backgrounds. It is said to be the world's second largest street party after the Rio Carnival held in Brazil. The carnival consists of costume parades, a steel band, jazz and reggae performances, and countless street vendors selling exotic Caribbean food, as well as a rollicking street party which attracts people from all walks of life. For more information, check out the official website listed below.